Kids, look over the rim of your tea cups! Africans fall for European scammers. DODGY PAPERS ... Official opposition leader, McHenry Venaani with 'professor' Michael Addison. ON THE DAY that Popular Democratic Movement leader McHenry Venaani proudly announced to the world that he had been bestowed with an honorary doctorate, this writer received a “personal invitation” to “receive the honorary doctorate degree” from the same 'institution'. The “personal invitation” (see The Letter) from the London Graduate School and Commonwealth University, operating from a London, United Kingdom, address cordially invited this writer to “participate in a life changing seminar at Dubai” at which an honorary doctorate from Commonwealth University would also be conferred. The honorary doctorate would be conferred on the last day of a three-day “loaded value-adding workshop” at the swanky Arabian Courtyard Hotel and Spa in Dubai, United Arab Emirates (UAE), a few weeks from now, from 11 - 13 December 2018. The modus operandi to reel in “honorary doctorate degree” nominees is quite simple really – appeal to the addressee's vanity and sense of self-importance. But it's an ego trip that comes at a steep cost, for the nominee will only receive the “honorary doctorate degree” after paying US$5 500 (±N$77 000) “to cover course materials, lunch, snacks, Master Class Certificate in Leadership and Management, Intensive Seminar and coaching during the event”. Despite this hefty price tag, quite a number of prominent Namibians appear to have fallen for the London Graduate School / Commonwealth University “honorary doctorate degree” scam, which predominantly appears to target Africans of some sort of elevated profile, with official opposition leader Venaani being the latest. 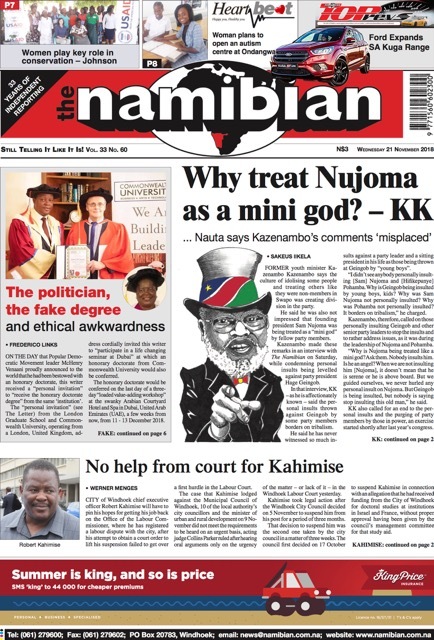 According to reports, other Namibian 'luminaries' who have fallen for the “honorary doctorate degree” are former cabinet minister Pendukeni Iivula-Ithana, businessman Erastus 'Chicco' Shapumba, Fysal Fresh Produce's Fysal Brenner, and recently ousted corruption-accused Namibia Institute of Pathology (NIP) CEO Augustinus Katiti. Neither the London Graduate School nor Commonwealth University are traceable on the British government's online portal where prospective students can browse for accredited tertiary education institutions in the UK. According to the “personal invitation” email, the London Graduate School and Commonwealth University jointly operate from 9 Offord Close in north London. However, Google street view shows this address to be a very ordinary semi-detached residence (see The Campus). The emailed invitation also lists Mayfair Point, 34 South Molton Street, London, as their “central London office” address, but this also does not have the appearance of a centre of learning and it is unclear what happens at that address. In fact, the Commonwealth University actually only seems to be registered in the Caribbean tax haven of Belize as the Commonwealth University of Belize while the London Graduate School claims to be registered in England, even as its registration is hard to trace and doesn't appear to be as an education institution. On the Commonwealth University website the London Graduate School is mentioned as “the official tuition provider for Commonwealth University Belize programmes”. Despite the London addresses, up until early 2018, when they started sending email invitations, all “personal invitation” letters were received from a Nigerian address. At the heart of all the apparent confidence trickery are three individuals – 'professor' Michael Addison, Sadiksha Rai and 'professor' David Iornem. According to online marketing material of something called the 'Dubai Leadership Summit', which seems to have been a London Graduate School / Commonwealth University initiative, 'professor' Michael Addison, listed online as the chancellor of Commonwealth University, is a “noted writer on seventeenth century religious history. Michael has many years of experience in further and higher education. He is currently a director at Global Exams Education Centre UK (GEECUK)”. Despite these claims, it is remarkably difficult to find any of Addison's writings on “seventeenth century religious history”, if they exist. Similarly, the Global Exams Education Centre UK does not come up in a Google search. It is questionable whether Addison is actually a professor, for in a 2017 post on the website of something called the International Foundation Group, Addison is listed as a founder and the holder of a master's degree. 'Professor' David Iornem, a Nigerian national, appears to be a founder of the Commonwealth University, who is described in 'Dubai Leadership Summit' material as a “management consultant, university teacher and author of international standing ... Prof David Iornem is an Accredited Management Trainer”. Once again, for an “author of international standing”, aside from mentions on his own website, Iornem's books are hard to find anywhere else. His qualifications are also suspect, as a Google search of some institutions he lists as having conferred qualifications on him show them to be as dubious as his Commonwealth University, with some seemingly not even existing any more. One online report described him as “fake professor David Iornem”. According to reports, in 2013 and 2014 Iornem was arrested by Nigerian anti-corruption authorities for operating “two unaccredited private foreign universities” that “duped some unsuspecting Nigerians through fraudulent admission and certificate offers”, as well as on money laundering charges that included transferring “US$307 000 derived from racketeering in the award of honorary degrees of Commonwealth University to acquire a two-bedroom flat at No. 9 Offord Close in London”. It is unclear what became of these cases. Sadiksha Rai's signature appears on the “personal invitation” letter. Rai presents herself as head of “Continuing Education Programmes” at the London Graduate School and Commonwealth University. However, her LinkedIn profile states that she works at a London shop of British retailer Marks & Spencer. All in all, according to a late 2017 article in Insight Namibia magazine, the London Graduate School and Commonwealth University “has elements of a 419 scam (so-named after the section of the Nigerian Criminal Code dealing with fraud) – albeit a more elaborate version of the letter from some bank official who just happens to have come into several million US dollars. But the scam it most closely resembles is the Degree or Diploma Mill – an organisation that claims to be a higher education institution that provides highly questionable degrees for a fee. Except in this case it is a 'Doctorate Mill'”. When approached for comment on Monday about the dubious “London Graduate School / Commonwealth University” and its “honorary doctorate degree”, McHenry Venaani stated, in response to a question about paying for the “honorary doctorate degree”, that “I must therefore place on record that I did not pay any funds to receive this honorary doctorate. I must remind you that honorary doctorates are conferred as a way of honouring a person's contributions to a specific field or to society in general”. He stated that “neither have I participated in anything bogus or fake”. Other political figures in southern Africa have also been targeted by the “London Graduate School /Commonwealth University”, including Zimbabwean opposition leader Nelson Chamisa. According to an online report, Chamisa said that many Africans fell for such scams because they “are obsessed with titles and this was driving them to obtain PhDs, even if they were fake. It's true, [the Commonwealth University] asked for some payment meant to cover graduation and ancillaries, but I turned them down. I have worked all my life and the concept of honorary degrees does not appeal to me, especially from institutions whose legitimacy is in question. Our society is obsessed with titles. It is to me a funny strategy by some people to boost their public profiles and supposed net-worth, but it does not work”. The issue of Venaani's “honorary doctorate degree” speaks to political ethics and the wisdom and maturity of leadership. Venaani has on occasion publicly questioned the personal and political ethics of his political opponents, but now the “London Graduate School/Commonwealth University” honorary degree issue shines a bright light on his integrity. – Brandon van Wyk also contributed to this article.